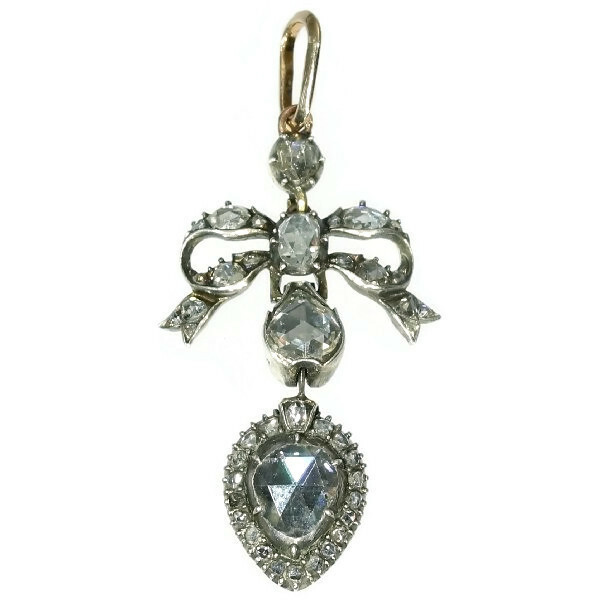 Antique Georgian era love pendant with big rose cut diamond: Description by Adin Antique Jewelry. This Georgian pendant crafted in silver with an 18K yellow gold back has four rose cut diamonds set on foil cascading straight to your heart in the increasing shapes of a circle, to an oval, a pear and an inverted pear representing a heart. If that's not enough as a display of sincere devotion, you're in for an extra treat with the charming diamond-encrusted bow sprouting from the oval diamond and the rose cuts as sunbeams around the suspending heart. The pendant features a gold loop and back, whilst the rest of it is executed in silver. This technique, called silver on gold, is quite common in pieces from that era. This practice stems from the fact that silver is the best material to enhance the natural sparkle and fire in the diamonds, whilst the gold prevents the wearer’s skin and clothes from tarnishing once the silver starts to oxidate. Diamonds: One big, three medium and 39 smaller rose cut diamonds . We do not have the weight of the diamonds which is normal in our trade when it comes to rose cuts.